Most cases of NSIP are idiopathic. However, NSIP pattern can be seen secondary to various systemic diseases and exposures. Therefore, clinical history, time course of disease, exposures, and radiographic findings should all be correlated before idiopathic NSIP is diagnosed. Since NSIP is usually diagnosed based on wedge biopsy specimens, sampling limits gross evaluation in most cases. Nonspecific gross findings may be observed on wedge biopsy, including increased stiffness of the pulmonary parenchyma secondary to interstitial inflammation and fibrosis. CT scanning is typically used as a surrogate for gross evaluation, since it allows evaluation of the entire lung. Gross evaluation of the entire lung may be possible in explant specimens (in patients with NSIP who are undergoing lung transplantation) or at the time of autopsy. In this case, the interstitial fibrosis tends to be bilateral with some accentuation in the lower lung zones. 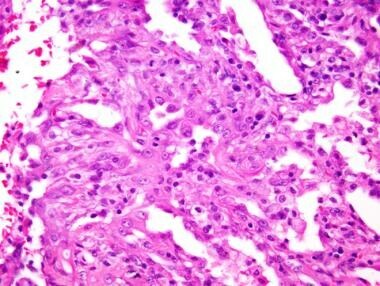 However, the fibrosis tends to be more diffuse than that seen in UIP, with less accentuation under the pleural surface. Cobblestoning of the pleura and honeycomb change are rare findings in NSIP, while they are expected findings in advanced UIP. As mentioned above, NSIP is typically diagnosed based on wedge biopsy and rarely may be encountered in explant specimens or at autopsy. 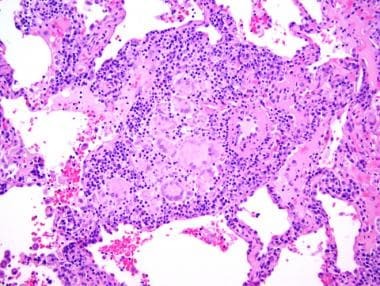 While samples obtained with transbronchial biopsy are the most common lung specimens seen in daily pathology practice, NSIP cannot be reliably diagnosed with transbronchial specimens. NSIP is a diagnosis of exclusion, since numerous other inflammatory and fibrotic processes involving the lung may have NSIP-like areas, including hypersensitivity pneumonia, UIP, DAD, LIP, DIP, infectious processes, and aspiration pneumonia, among many others. 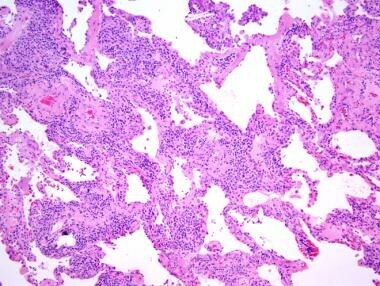 Sampling of large areas of pulmonary parenchyma (ie, wedge biopsy), ideally from multiple lobes, is required to adequately evaluate for these other possibilities, and the sample size typically obtained via transbronchial biopsy is simply inadequate for such evaluation. 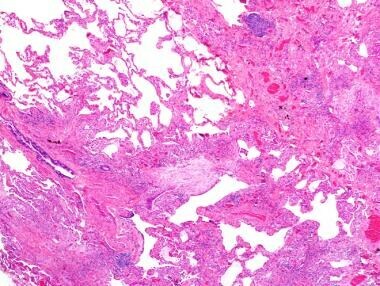 Therefore, descriptive diagnoses should be used when a transbronchial biopsy shows an NSIP-like appearance. Cellular non-specific interstitial pneumonia (NSIP) pattern. Note the widespread thickening of the alveolar septa by a cellular infiltrate. Cellular non-specific interstitial pneumonia (NSIP) pattern. On higher power, the septal widening is due to a mild to moderate infiltrate of lymphocytes with scattered plasma cells, with minimal associated fibrosis. 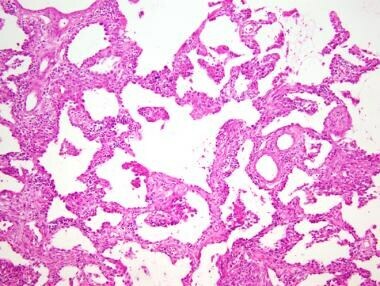 Fibrotic non-specific interstitial pneumonia (NSIP) pattern. Interstitial fibrosis uniformly involving the lobule. 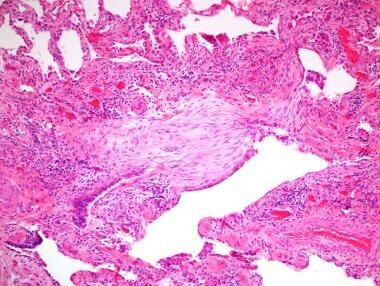 Fibrotic non-specific interstitial pneumonia (NSIP) pattern. On higher power, the alveolar septa are thickened by dense collagen fibrosis with scattered chronic inflammatory cells. Immunohistochemical stains are not useful in the diagnosis of NSIP. There are no described molecular or genetic findings specific to NSIP. Importantly, the finding of NSIP pattern on biopsy should lead to a careful and thorough clinical evaluation for possible underlying etiologies. NSIP may be the presenting manifestation of collagen vascular disease, and NSIP can precede the diagnosis of the underlying disease by months or even years. Correlation with serologic testing and clinical signs and symptoms of underlying connective-tissue disease is essential. In some patients, the cellular NSIP pattern may be the only histologic finding of hypersensitivity pneumonia. Therefore, a careful exposure history should also be obtained in patients with NSIP. Correctly diagnosing interstitial lung disease can be a daunting task. The differential diagnoses of NSIP are broad and vary considerably depending on whether the fibrosing or the cellular variant is suspected. Knowledge of the clinical presentation and radiographic finding is very important when approaching interstitial lung disease. Correlation of the pathologic diagnosis with the clinicoradiographic findings is important to avoid errors and to expedite appropriate clinical workup and potential therapy. Fibrotic NSIP needs to be distinguished from UIP, especially considering the better prognosis and possible response to steroid treatment of the former. UIP is characterized by temporal and spatial heterogeneity, as opposed to the relative temporal homogeneity of NSIP. In UIP, areas of uninvolved lung are immediately adjacent to areas of end-stage fibrosis and active fibrosis containing fibroblast foci, while the fibrosis of NSIP tends to be all of the same age, with absent or inconspicuous fibroblast foci. UIP also tends to preferentially involve the periphery of the lobule, while NSIP tends to involve the lobule in a more uniform fashion. 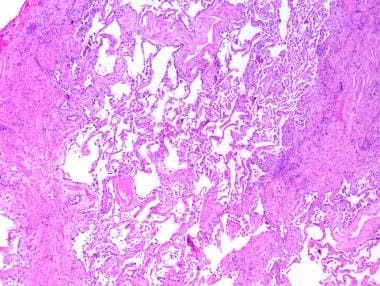 Architectural distortion of the underlying pulmonary parenchyma is also a hallmark of UIP, with large areas of fibrotic scarring effacing the underlying architecture with progression to honeycomb change (end-stage fibrotic lung containing spaces lined by bronchial epithelium, frequently containing mucus and inflammatory debris). Usual interstitial pneumonia (UIP). Interstitial fibrosis involving the lobule in a patchy distribution, as contrasted to the uniform involvement of NSIP. Usual interstitial pneumonia (UIP). Interstitial fibrosis involving the lobule in a patchy distribution with accentuation at the periphery, as contrasted to the uniform involvement of NSIP. Usual interstitial pneumonia (UIP). Note the microscopic honeycomb change, which is only rarely encountered in NSIP. Usual interstitial pneumonia (UIP). 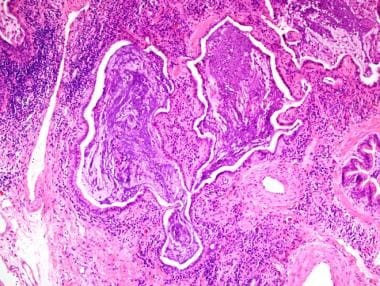 The interstitial fibrosis is a combination of dense collagenized fibrosis and active fibrosis, in the form of fibroblast foci, which are typically absent or inconspicuous in NSIP. While honeycomb change has been reported in fibrotic NSIP,  it is generally thought to be a rare or inconspicuous finding. 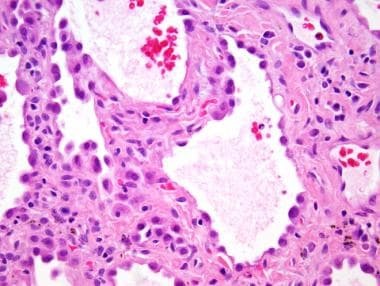 NSIP-like areas have been described in cases of UIP, and it is not uncommon for a biopsy sample from one lobe to show features of fibrotic NSIP while a sample from another lobe taken at the same time shows diagnostic findings of UIP. 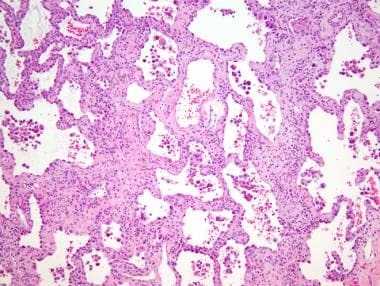 This phenomenon stresses the importance of adequate biopsy sampling in the diagnosis of interstitial lung disease. It is important to correctly distinguish NSIP from patterns of acute lung injury, including DAD and OP. Differentiating NSIP from organizing DAD can be challenging based on histologic grounds alone. Organizing DAD is characterized by widening of the interstitium by a combination of fibroblastic proliferation, type 2 pneumocyte hyperplasia, edema, and mild chronic inflammatory infiltrate. This fibroinflammatory process can closely resemble NSIP. However, other histologic clues are usually present in organizing DAD that guide in diagnosis. Organizing diffuse alveolar damage (DAD). Note diffuse septal thickening by a combination of fibrosis and inflammation, superficially resembling NSIP. Organizing diffuse alveolar damage (DAD). 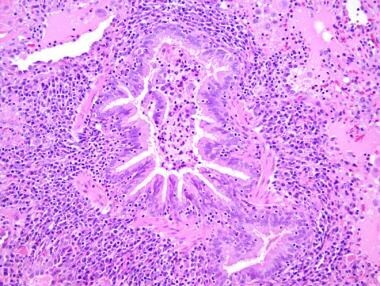 Marked type 2 pneumocyte hyperplasia and squamous metaplasia are frequently seen in organizing DAD but not NSIP. Organizing diffuse alveolar damage (DAD). Remnants of hyaline membranes can often be identifed as they are incorporated into the alveolar septa. Organizing diffuse alveolar damage (DAD). Fibrinous thrombi within the vasculature are frequently found in organizing DAD but not in NSIP. It is important to note that focal OP can be seen as a minor component in cases of otherwise typical NSIP, but it should represent less than 10%-20% of the pathologic lesions. [1, 3] When OP constitutes more than 20% of the abnormality within the lung, alternate diagnoses should be considered, including infection, adverse drug reaction, hypersensitivity pneumonia, or cryptogenic OP. The chronic inflammatory interstitial infiltrates of cellular NSIP may closely resemble the chronic interstitial pneumonia that is seen in other diagnoses. 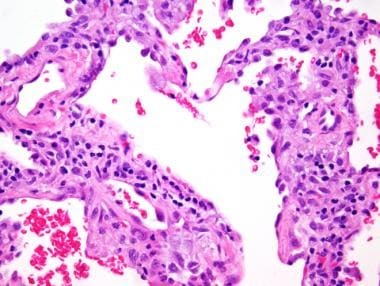 While cellular interstitial pneumonia is a component of hypersensitivity pneumonia, NSIP typically lacks the accompanying chronic bronchiolitis, scattered poorly formed granulomas, and OP. Hypersensitivity pneumonia (HP). Diffuse cellular interstitial pneumonia may superficially resemble NSIP. Hypersensitivity pneumonia (HP). Chronic bronchiolitis is an important diagnostic finding, which is not typical for NSIP. Hypersensitivity pneumonia (HP). Scattered poorly formed granulomas are key to the diagnosis, and not typical for NSIP. Katzenstein AL, Fiorelli RF. 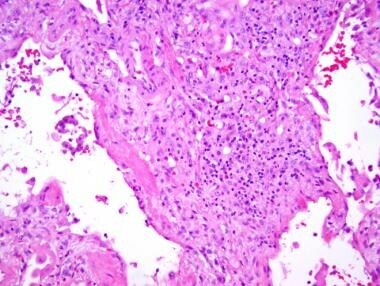 Nonspecific interstitial pneumonia/fibrosis. Histologic features and clinical significance. Am J Surg Pathol. 1994 Feb. 18(2):136-47. [Medline]. Travis WD, Hunninghake G, King TE Jr, et al. Idiopathic nonspecific interstitial pneumonia: report of an American Thoracic Society project. Am J Respir Crit Care Med. 2008 Jun 15. 177(12):1338-47. [Medline]. Collard HR, King TE Jr. Demystifying idiopathic interstitial pneumonia. Arch Intern Med. 2003 Jan 13. 163(1):17-29. [Medline]. Kim EA, Lee KS, Johkoh T, et al. Interstitial lung diseases associated with collagen vascular diseases: radiologic and histopathologic findings. Radiographics. 2002 Oct. 22 Spec No:S151-65. [Medline]. Kambouchner M, Levy P, Nicholson AG, et al. 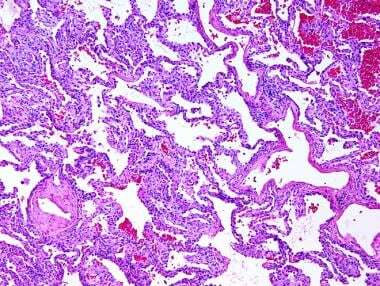 Prognostic relevance of histological variants in nonspecific interstitial pneumonia. Histopathology. 2014 Oct. 65(4):549-60. [Medline]. Kligerman SJ, Groshong S, Brown KK, Lynch DA. Nonspecific interstitial pneumonia: radiologic, clinical, and pathologic considerations. Radiographics. 2009 Jan-Feb. 29(1):73-87. [Medline]. Fujita J, Yamadori I, Suemitsu I, et al. Clinical features of non-specific interstitial pneumonia. Respir Med. 1999 Feb. 93(2):113-8. [Medline]. Kim TS, Lee KS, Chung MP, et al. Nonspecific interstitial pneumonia with fibrosis: high-resolution CT and pathologic findings. AJR Am J Roentgenol. 1998 Dec. 171(6):1645-50. [Medline]. Akira M, Inoue G, Yamamoto S, Sakatani M. Non-specific interstitial pneumonia: findings on sequential CT scans of nine patients. Thorax. 2000 Oct. 55(10):854-9. [Medline]. Sumikawa H, Johkoh T, Ichikado K, et al. Nonspecific interstitial pneumonia: histologic correlation with high-resolution CT in 29 patients. Eur J Radiol. 2009 Apr. 70(1):35-40. [Medline]. Flaherty KR, Thwaite EL, Kazerooni EA, et al. Radiological versus histological diagnosis in UIP and NSIP: survival implications. Thorax. 2003 Feb. 58(2):143-8. [Medline]. Li X, Chen C, Xu J, et al. Nonspecific interstitial pneumonia and usual interstitial pneumonia: comparison of the clinicopathologic features and prognosis. J Thorac Dis. 2014 Oct. 6(10):1476-81. [Medline]. Sumikawa H, Johkoh T, Fujimoto K, et al. Pathologically proved nonspecific interstitial pneumonia: CT pattern analysis as compared with usual interstitial pneumonia CT pattern. Radiology. 2014 Aug. 272(2):549-56. [Medline]. Travis WD, Matsui K, Moss J, Ferrans VJ. Idiopathic nonspecific interstitial pneumonia: prognostic significance of cellular and fibrosing patterns: survival comparison with usual interstitial pneumonia and desquamative interstitial pneumonia. Am J Surg Pathol. 2000 Jan. 24(1):19-33. [Medline]. Flaherty KR, Travis WD, Colby TV, et al. Histopathologic variability in usual and nonspecific interstitial pneumonias. Am J Respir Crit Care Med. 2001 Nov 1. 164(9):1722-7. [Medline]. Yousem SA. 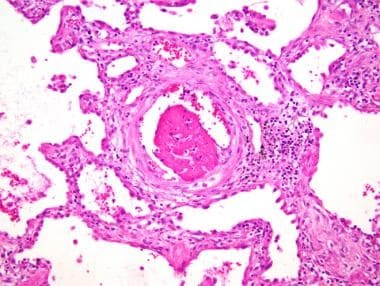 Respiratory bronchiolitis-associated interstitial lung disease with fibrosis is a lesion distinct from fibrotic nonspecific interstitial pneumonia: a proposal. Mod Pathol. 2006 Nov. 19(11):1474-9. [Medline].